There is something to a life of relaxation. Living each day at your own pace, and watching everyone else race past. We rise with great ambitions for the day. Donning shoes, and strolling down the hill, buckets in hand. Under an archway, and into an eden. There is the smell of seawater and ripe berries, the sun baking them on their vines, and somewhere the gentle notes of folk tunes. 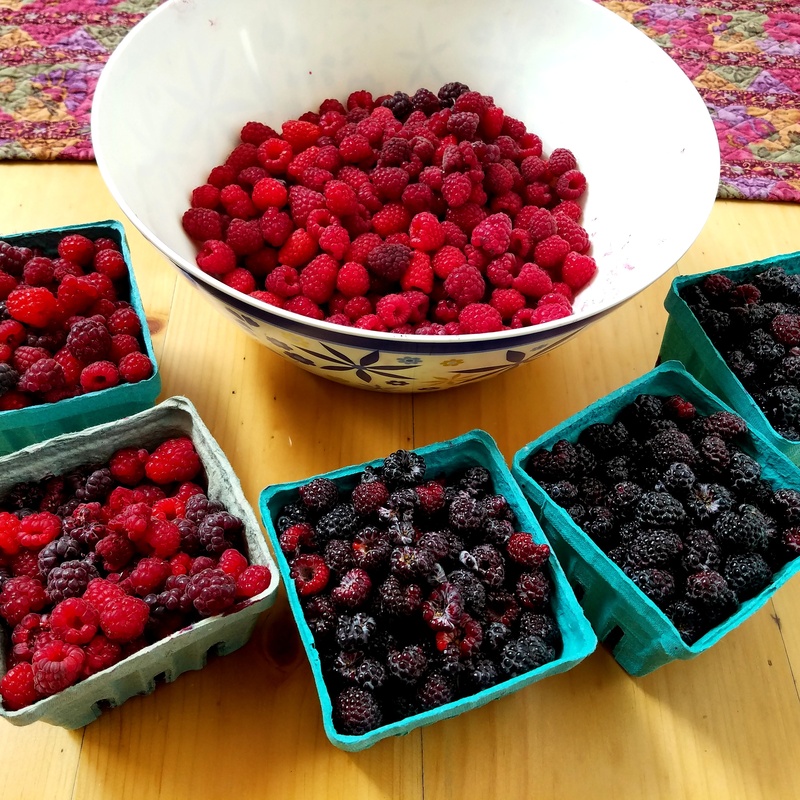 The real poetry is in the picking. The cris-crossed vines laden with juicy reward, covered in thorns, poking and tearing at skin each time you reach in. The poetry is in the danger, the pain, and yet we still press forward. And I am reminded of two young girls, spending time in an apartment just off the highway. Keeping themselves occupied by catching bugs and throwing them out the second story window in home-made capsules with parachutes, then racing outside to gauge the bug survival rate. I am reminded of them ducking under the wire fence next door, and merrily plucking at the raspberries. Careful of the thorns and spiders. And playing as ignorant children when the owner began yelling at them. Lola is happy to be anywhere we are. My ill-chosen shoes fight gravity as I attempt the bush on the hill, trying desperately to not reach out and grab a handful of thorns, nor fall face-first into those thorns. 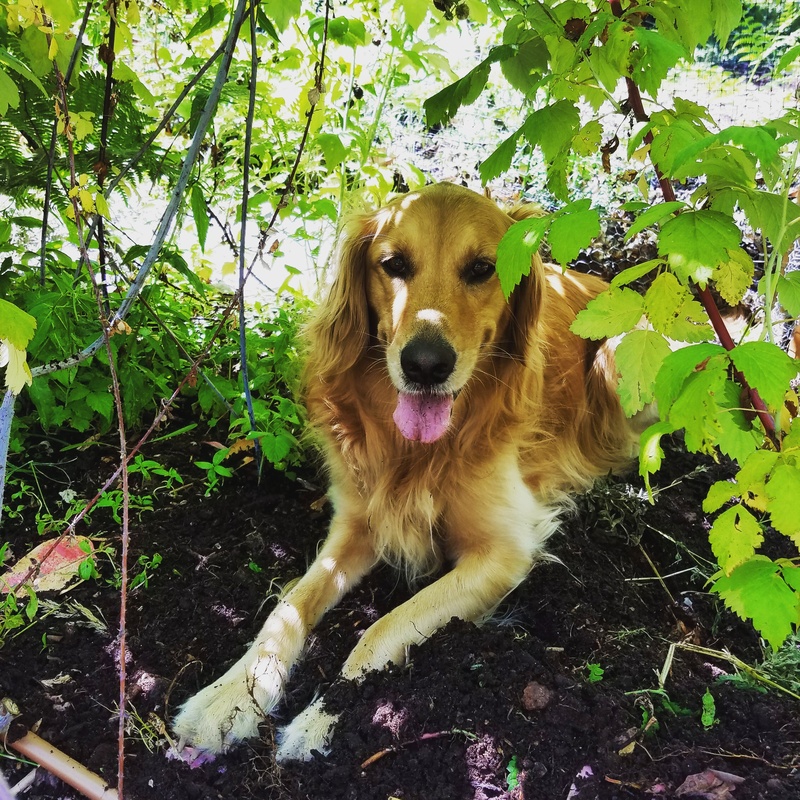 Lola barrels under leaves and thru the vines, settling into a shaded spot square in the middle of the bush. She starts out by rescuing the berries I fail to catch, then digging holes, perhaps offering some sort of burial to them, but simply kicking dirt onto my feet. She runs happily, up and down the hill, as our buckets grow full. Until the sun reaches its peak, chasing moisture down our brows and necks. And when it begins to feel like work, we trudge back up the hill, and drive home, our buckets full and our fingers red.